2018 was a busy year! The Pro Bono Program established itself as the anchor for the corner of the 3rd floor. The office is bright and full of memories, ideas and plants! But moving from the old law school was just the beginning! A big step was the formation and implementation of our first Alumni Advisory Council. This core group of 10 dedicated former students met with our current board and have already started to add their voice and ideas to the pro bono mix. 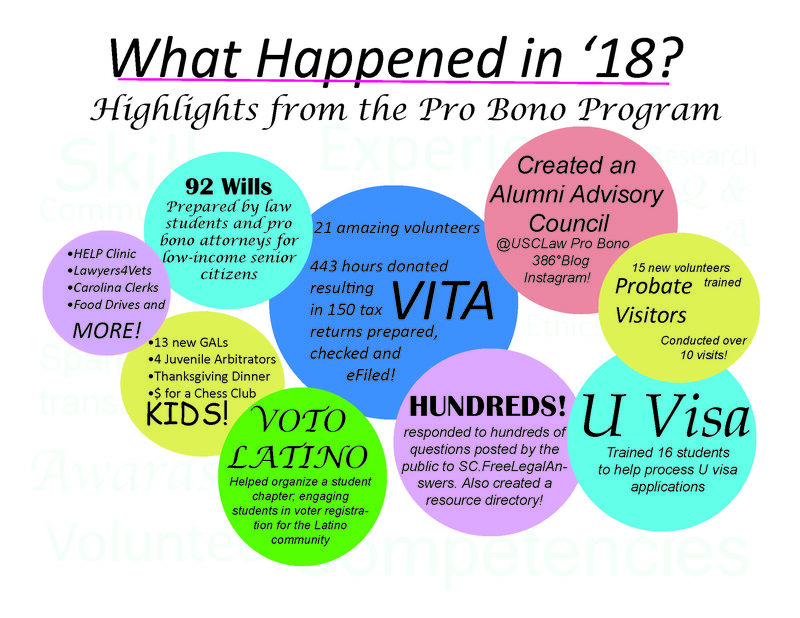 Enjoy this infographic that highlights some of the actions taken by volunteer students in the past academic year, but know that it is the tip of the iceberg! This entry was posted in Administrivia on 7 May 2018 by Pam Robinson.